Jicama (pronounced "hic-cah-mah") is an interesting and nutritious root vegetable grown widely in Mexico and Central America. It sort of looks like a brown or tan turnip with mild, sweet, juicy, white flesh similar to that of an Asian Pear. Although it can be cooked, typically it is eaten fresh as snacks and in salads. It makes a lovely addition to crudites platter as it does not discolor upon exposure to air. Jicama makes a great alternative for water chestnuts in stir-fries retaining its crunch as well as mingling nicely with other ingredients. Jicama is low in calories, very low in sodium, has a goodly amount of Vitamin C , a good source of fiber and is available year-round. A half cup serving of Jicama (60 g) contains only 25 calories, 0 g fat, 0 g sodium, 3.2 g fiber, 5 g of carbohydrates and provides 20% Vitamin C needs of an adult based on a 2000 calorie diet. So go ahead and eat up - Jicama can contribute toward your 5 to 9 servings of fruits/veggies a day quite deliciously! This is a very simple but delicious salad based on the Indian snack-vendor fare. Snack vendors in India often hawk various fresh/cooked veggies, fruits, bean sprouts, etc sprinkled with a spicy salt concoction like chat masala and lime juice. Lime juice and spices combined with a little salt bring out the hidden sparkle in many veggies and fruits. I particularly love the following colorful veggies for this salad; choose your own favorites according to seasonal availability for infinite variations. Chat Masala may be used instead of the salt and spices in the following recipe. Black Salt and Chat Masala are available in Indian Markets. Wash, dry, and peel the jicama. Halve or quarter the jicama if too large and slice thinly. 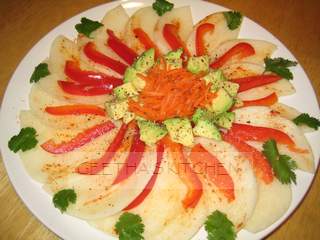 Arrange the jicama slices and other veggies prettily on a platter and sprinkle with the lime juice, salt and spices. Let marinate for about 10 minutes before serving. Garnish with the cilantro and serve. Enjoy!